Mr. Thomas graduated from Phillips University and the University of Colorado School of Law. He worked 10 years in the Denver District Attorney's Office as a deputy and Chief Deputy District Attorney. He tried homicide cases, white collar crime, complex drug cases and spent the last 3 years in the Complex Prosecution Unit. He then spent 2 1/2 years as an Assistant United States Attorney attached to the Mountain States Drug Task Force and served as the coordinator for this regional drug enforcement effort. He served as Jefferson County elected District Attorney for 12 years and as the Executive Director of the Colorado Department of Public Safety for 6 years. 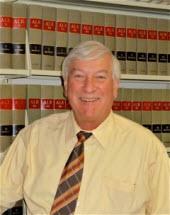 Mr. Thomas also was the Executive Director of the Colorado District Attorneys' Council for 2 years. He has been a private criminal defense attorney for the past 5 years. As a defense attorney he has handled cases from 1st Degree Murder to Driving Under the Influence. He also specializes in drafting requests for Pardons and commutation of sentences.